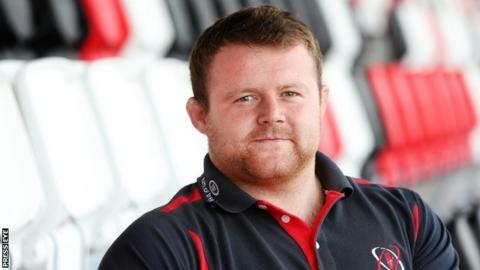 Ulster Academy prop Andrew Warwick has signed his first professional contract with the Irish province. Warwick's two-year deal means he will remain at Kingspan Stadium until at least the summer of 2017. The Ballymena man made his Ulster debut against Cardiff last March and has had 15 further appearances for the side. "When I joined the Academy my aims were to play for the first team and to sign a professional contract with Ulster," said the loose-head prop, 23. "I am delighted now to have achieved both those things. "The past nine months have been incredible. I am extremely proud to represent Ulster and I look forward to helping the team be successful in the coming seasons." Ulster team manager Bryn Cunningham says Warwick has made the step up from Academy prospect to first team regular "with ease". "He is now a highly important player for us in a key position," said the Ulster team manager. "It is crucial for Ulster Rugby moving forward that we retain a core group of home grown talent who possess an ambition that fits in with our culture. "Andrew is one of those players and we are delighted he has committed to two years." Warwick previously played for the Ulster Schools and Ulster Under-20s.